Built in 1908 and fully renovated in 2004, it was born from the renovation of the emblematic Modernist building known as “Casa Fuster”, designed by the famous Catalan architect Lluís Domènech i Montaner, whose Modernist works have been declared World Heritage Sites by UNESCO. It can be defined as the most emblematic designer hotel, quite simply because it is. The Hoteles Center chain acquired the building in 2000 rehabilitated it using the utmost respect to the building’s originality while at the same time optimized the spectacular architectural singularity. The hotel opened it’s doors in 2004. 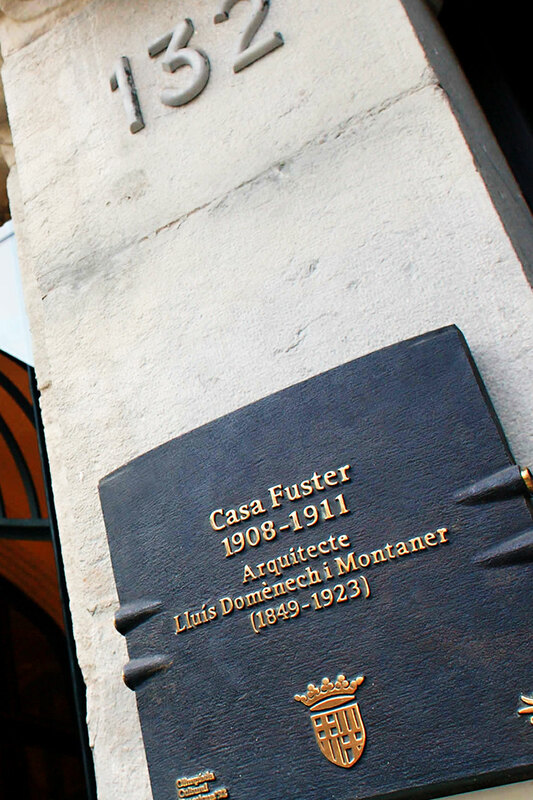 Casa Fuster is not just the culmination of Domènech i Montaner’s masterpiece, but also a building that projects great dignity, it’s the crowning closure to the Eixample neighborhood, it is also the symbol of the greatest period of splendor and prosperity Barcelona has experienced during the past hundred years. Mr. Mariano Fuster i Fuster, a gentleman from Mallorca’s upper class, met Ms. Consuelo Fabra i Puig, the daughter of the Marquis of Alella, in Barcelona. The architect Lluís Domènech i Montaner ws in charge of this ambitious project and he designed and built the house under the supervision of Consuelo Fabra i Puig. Mariano Fuster put the house in his wife’s name and dedicated a rose window to her with the initials CF, which can be found on Carrer de Jesús. 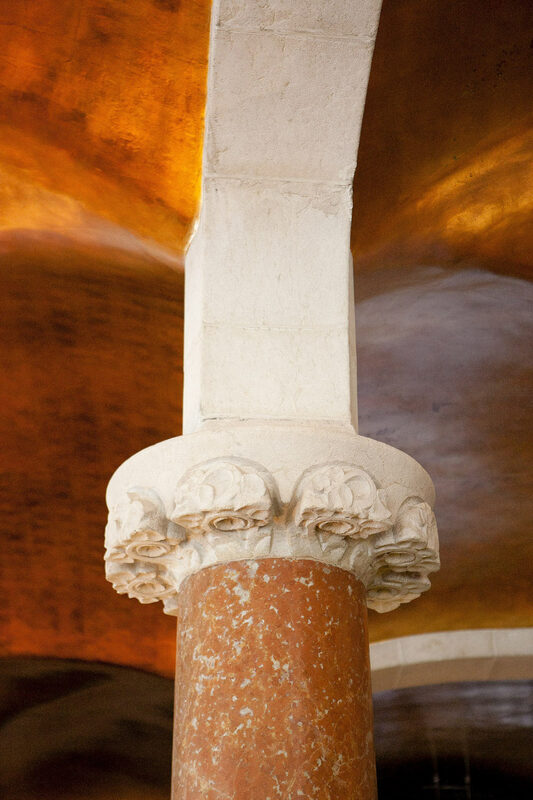 Mr. Domènech i Montaner, the world-famous modernist architect author of works such as the Palau de la Música Catalana (declared a World Heritage Site by UNESCO), built Casa Fuster with three facades of great impact due to their details and expressiveness. 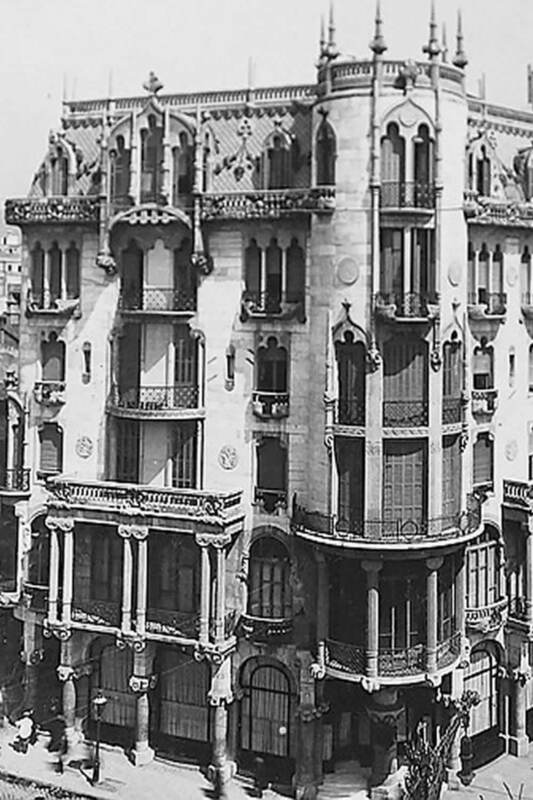 The works began in 1908 and the Fuster i Fabra family entered to live in its first floor in 1911. That year, Casa Fuster was considered the most expensive house in the city due to the material used in its construction, among them marble of the highest quality. The house’s facade was the first one in the city made with white marble. Due to the elevated costs of the construction of the house, the Fuster-Fabra family left in the early 1920s. Since then, the area of Café Vienés had many functions: small businesses like a barber shop or a grocery store. What today is Sala Domènech i Montaner was a dance hall in the 50s known as El Danubio Azul. In 1962, the ENHER electrical company bought the house with the intention of demolishing it and building a skyscraper. The people of Barcelona were completely against it and thanks to numerous protests and newspaper articles, this catastrophe was avoided. They managed for ENHER not only to not demolish the house but also to renovate it, which took place between 1962 and 1974, with the last renovation being done in 1995 (all of them basic). In 1999, Casa Fuster was put on sale and Hoteles Center bought it a year later, transforming it into the current Hotel Casa Fuster.